2. In which year was the Prevention of Terrorism Act (POTA) enacted? 3. Who held the power to increase the number of judges in the Supreme Court? 4. Which one of the following is NOT the main jurisdiction of the High Court of a State? 5. Which one of the following states does not have in High Court? 7. Who is the final authority to interpret the constitution? 9. Which of the following state/Union territories have a common High Court? 10. 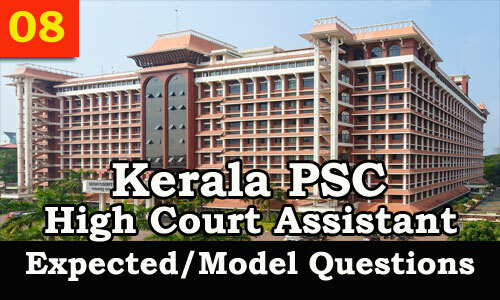 Which of the following High Courts is the second oldest in India? 13. The system of Public Interest Litigation has been introduced in India? 14. Who among the following appoints the acting Chief Justice of India? 16. The Mumbai High Court does not have a bench at which one of the following places? 17. Which one of the following High Courts has the territorial over Andaman and Nicobar Islands? 20. Who among the following had the longest tenure as the Chief Justice of India? 21. The first Lok Adalat was held in which year? 23. Judicial Review in the Indian Constitution is based on which of the following? 26. How many High Courts in India have jurisdiction over more than one state (Union territories not included)?